6 week course $99.00, with new lessons available every few days. You may purchase the DVD compilation via Paypal for $24.00 + S&H at any time, including during initial registration. Seven great reasons for you to take this online class! 1. Have you read the book but are still a bit unsure how to train your dog? 2. Do you hate driving at night to class when it gets dark so early? 3. Are you worried about road conditions in the winter? 4. Do weekly group classes not fit into your busy schedule? 5. Are you having a hard time finding a positive trainer in your area? 6. Does your dog gets so carsick that going to a group class is a problem? 7. Is your dog just a tad overzealous right now to bring into a group class? If you’ve answered yes to any of the above questions, then the You Can Train Your Dog online class is for YOU! Positive training is not mindless permissiveness, nor is it randomly throwing cookies around, hoping for the right behavior to happen. 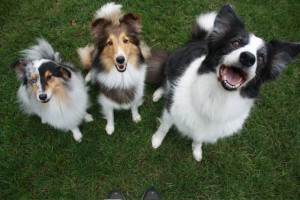 As you will see, it’s a powerful and scientific system for breaking down the barrier between dog and human communications, producing desired behaviors or preventing undesired behaviors. I’m going to ask you to get rid of your (possibly) preconceived notions of “dominating, correcting, punishing, control, command, and obedience” and replace them with “influence, show, teach, trust, cue, and manners.” You may find it hard at first to believe, but your dog will learn faster once you eliminate these notions. Your dog is not the enemy, and training your dog doesn’t have to be a battle of wills (not even if you have a hound or a terrier! ), but a mutual learning process, building up a foundation of trust and respect. Your dog (yes, your dog, the one who seems to be on a mission to wreck as much of your house as possible, as fast as he can) really does want to do the right thing, if you can show him how. In the beginning, you’ll just have to trust me on this one: Your dog is fine – it is your current lack of understanding on how dogs learn that’s the only thing holding you back. In this course, I will teach you to communicate with your dog, so that your relationship will become something you will treasure for years to come. This course was designed to be taught in the same order in which I teach these behaviors in my regular group classes. • Each step gradually builds on the previous one, along with the relationship aspect of these behaviors. One simply can’t train a loose leash walk if there is no connection between you and your dog. You will see such a class in all of the videos. These are real dogs, real handlers, real issues, all shown in real time. • There are a total of 15 lessons, along with video clips. I will be spreading these out over a 6 week period. • Each lesson will include text and a video clip(s). • You will have a total of 50 days to come back to the site to re-read and watch the video clips. • You will be able to post questions, problems or comments to the blog. I will be monitoring you questions and comments, and will answer as soon as possible. • Because dog training is such a visual thing, I encourage you to video tape yourselves and your dogs if you are having a problem, post it to Youtube.com (free account) and then post your link so we can all look at it and discuss it. • You may purchase the DVD compilation via Paypal for $24.00 + S&H at any time, including during initial registration. • If you need ceu’s, you’ll need to tell me ahead of time. In order for you to get them, you will need to post on every lesson and send me links to video of you and your dog(s) working the lesson. As I always do with all of my work, I left the mistakes in the video clips so you can see what to do and what not to do! While many of the lessons are from You Can Train Your Dog! Mastering the Art & Science of Modern Dog Training, there will be some text that isn’t in the book and some lessons that are in the book aren’t in this course. If you don’t already own a copy of the book, you can pick one up at my store or Amazon. Legalize: Please note that all of my content – the printed lessons and video clips – are copyrighted. Please do not share. Thank you! *If you are a CPDT or CBCC you will need to let me know as soon as you sign up for the course and you will have to post comments and video on every lesson to be eligible for ceu’s.